In this approachable how-to book, a former actor turned professional speaker lays out a path to confident public speaking, an asset that she says has become increasingly valuable in today's business environment. Divided into two parts, the book first seeks to determine (and diminish) a person's level of anxiety; then, it guides readers through tips and exercises that should help them learn to address an audience comfortably. 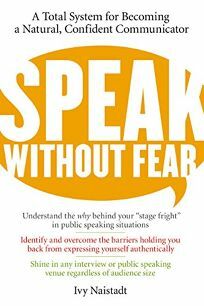 Naistadt believes that the presentation of a natural,""authentic"" self is the key to successful public speaking and that stage fright, which she defines as""a crippling form of anxiety that stops us in our tracks,"" is usually what prevents people from being themselves when they're behind the podium. The book helps readers deal with those issues that cause stage fright, such as fear of embarrassment or bad past experiences. Suggestions for overcoming public speaking paralysis include simple breathing exercises, maintaining good posture, clearly defining the objective of the speech, studying the subject matter and, most important, rehearsing, rehearsing, rehearsing. Though none of this information is ground-breaking, Naistadt's anecdotal tales of her own experiences as an actor who struggled with inhibitions and anxiety, as well as her tales of clients and their public speaking travails, give this manual a friendly, conversational tone that should appeal to any person facing a big presentation, whether it's a high school senior planning for college interviews or a high-level employee making a year-end report.